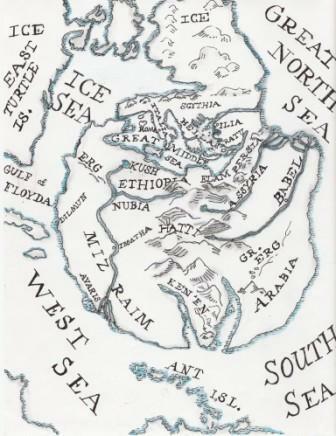 Neo-Rome, Mizraim, & Other Atlantis II States, With N.A. The Great Sea in northern Atlantis saw a number of outstanding civilizations and city states, and chief was the neo-Roman. From Rome the capital the empire stretched from the eastern shore of the island continent to the Stone Gods of the North American hinterland (Mount Rushmore), ruling a captive citizenry of about 70 millions. Chief Atlantean provinces were Iberia, Italia, Etruska, Achaea, Cyrenicia (including Keftiu or Crete), Macedonia, Mizraim, Judaea, Arabia Felix. North American provinces were Provencia, Gaul, Alemannia, Trans-Oxiana (Land Beyond the Sea of Oxus, the sea dividing the two North Americas). Three Kingdoms formed prehistoric Mizraim: the Bee Kingdom of the Delta or Lower Mizraim, the Reed Kingdom of Mid-Mizraim, and the Hawk Kingdom of Upper Mizraim. With Mizraim's most ancient cities, like Ga'arta, in senescent decline, the middle portion was least populated and in the historic period nothing more was heard of it. Its provinces were quietly absorbed by the other two more vigorous kingdoms after unification by Narmer I. By his time of the Hyksos the middle kingdom no longer was named as an honorary part of Mizraim, even though it did not exist. 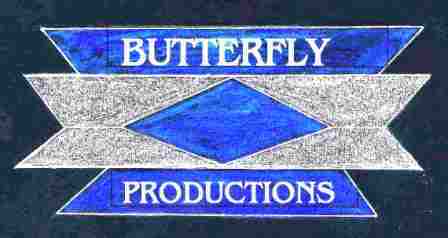 The Two Kingdoms were named instead. After the word "kemi" for river-borne silt, the whole region was often called the Land of Kem. From the color of red desert surrounding the black-silted river valley, the region got another popular name, the Land of Red and Black. Upper Mizraim was also called the White Kingdom, Lower Mizraim was known as the Red Kingdom, after the white and red crowns wore by the respective kingdom's rulers. (On Earth, Mizraim was later called "Egypt" after the Coptic people who formed the original population during the Roman era and afterwards. This name did not take firm hold on Earth II, however, for the traditional name, Mizraim, survived into the modern eras). The population at its height was about four or five million, but these were for much of Mizraim's earlier history well-fed and relatively well-housed in a hot climate requiring no heating of buildings. Having no comparison, this society assumed it was the center of the Universe and nearly proved it. Beginning with the mouth of the River Ioteru, at the head of the Delta facing the south Atlantic, Mizraim's chief cities were: Avaris (Hyksos Period of Pharoah Seuserenre Khian), Nathasta, Machitha, Ga'arta, Ibbatha, Tammu (at the First Cataract and the site of the Ioteru-meter), Gerasa (frontier fortress city at the Second Cataract). 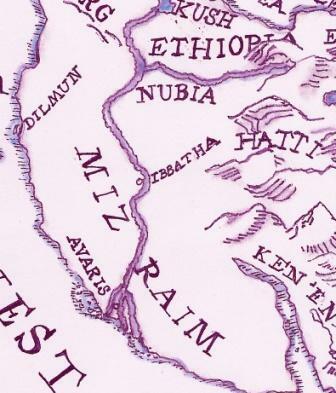 Beyond lay cities and encampments of the Nubian and Ethiopian peoples--longtime allies and vassal-states of Mizraim. Machitha was the traditional capital of Lower Mizraim (the North), Ibbatha the traditional capital of Upper Mizraim (the South). 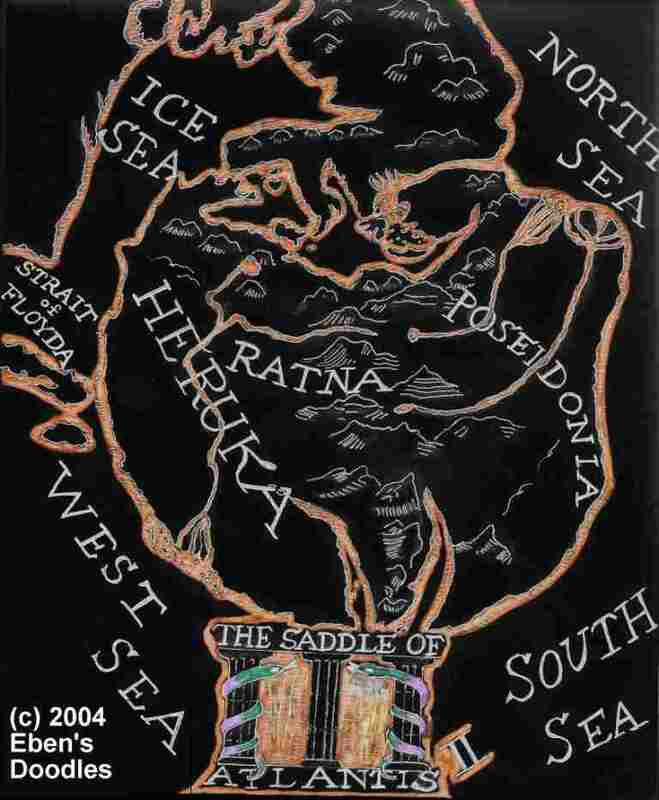 The island continent of Atlantis had three nations by the time of Homer Bean (Book Two of Volume II of Retro Star, begins with this new continent)--east to west: Poseidonia, Heruka, and Ratna. Heruka-Ratna was an allied constitutional kingdom, with its capital at Multan, the old Ratnan capital in what had been Nubia/Ethiopia above the Third Cataract in the far north. Poseidia in the Azores was the capital of Poseidonia, which had been moved westerly from the original site, since that was destroyed and submerged in a collapse of the easternmost extension of Atlantis II that briefly made the Azores and the Canary Islands part of the new mother continent. 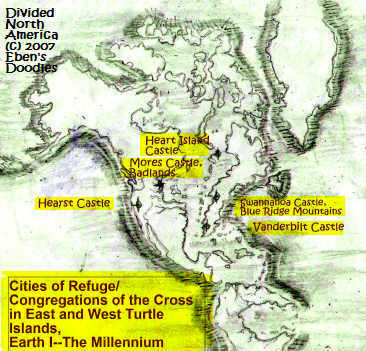 East/West Turtle Islands, or North America (south of the Laurentian and Athabascan Shield Glaciers and extending across the Middle Sea to both halves of the split continent, and including Central America) was governed by the Confederate States of America. Only the Northwest coast of the Western Island Continent held free, forming the Empire of Kolumbia. Though no longer of former prime political importance to the rest of the world, South America (the former Amazon River Basin drowned by the Atlantic) was home for The Argentinos, a seafaring, competitive league of commercial, trading city states with adjacent territories, much like those in Renaissance Italy on Earth. 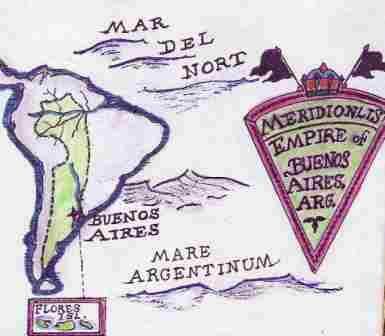 These rose up in the political vacuum left by the utter collapse of the Empire of Meridionalis based pm Buenos Aires, the short-lived adventure of a pretentious, misplaced "Empress," the beautiful former serving wench to Lady Anne, Duchess of Millhaven, Britain--the latter the only person who might have made such an imperial state work if she had been at the helm instead.